I love shopping for products for toddlers and babies. There’s something so special about the ‘little people’ section of stores, and it’s fun looking for things that a toddler will enjoy or that will make his life—and mine! easier. Ofcourse, sometimes online shopping takes the place of wandering through stores looking for the best merchandise for toddlers at the best price. You get all the fun of the purchase without any of the inconvenience, and you can be sitting at home shopping with your toddler playing beside you. If you’re ready to potty train your toddler a cute little potty needs to be one of your first purchases, and one fun one is the Fisher Price Froggy Potty. It’s affordable, fun-looking, and easy to clean. The bucket comes out, so you can dump and rinse it easily. The seat is comfy to sit on, and it’s made of sturdy plastic. This potty is compact enough it won’t be any trouble to stick it into the trunk of the car for road trips, and the little one will have an instant bathroom wherever he needs it. If you’d prefer not do the dump-out routine you can always get a little step stool for your child and a potty ring that will make your toilet seat smaller and safer—or get a Mommy’s Helper Contoured Cushie Step Up; a convenient two in one affair. Set this up over the toilet your child will use for a no-fuss, no-mess, no-scare setup—your little one gets to trot up the step, sit down over the soft, appropriately sized seat, and go potty in the same place that mommy and daddy do. It folds for easy storage, and has non slip floor pads and non slip handles that your toddler can grasp as he climbs. 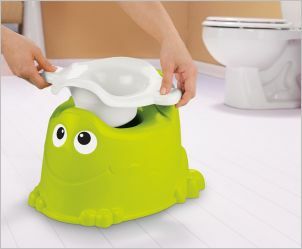 This potty seat is quite sturdy and very easy to set up. If you’re looking for sheet sets for your toddler you can read our special page all about that. You’ve got plenty of choices to make your child’s bedtime extra-special. There’s another extremely important ingredient for toddler bedtime though—a goodnight story! Our favorite toddler bedtime story is the classic Goodnight Moon —the pictures are engaging and the text is just short enough to be able to hold a toddler’s attention span as you go through the book. There’s something about this story that seems to calm little people and get them ready for sleep—don’t be surprised if you hear a big yawn at the end! Your toddler’s favorite time may be playtime, and with educational and fun products for kids and toddlers you can help your child learn even as he plays. 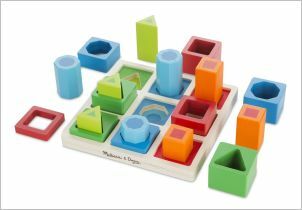 The Melissa & Doug Shape and Sequence Sorter is one way to help your toddler learn categorization, colors, and sequencing—and have fun doing it.. We love this toy because it’s open-ended—when your toddler learns one skill, he can move on to the next. It’s also sturdy, bright colored, and a perfect shape for those little hands. If you’re looking for toys that focus on exercising your child’s gross motor skills you might want to look at a push and ride tricycle—and one of the cutest things on the market is the Little Tykes Go and Grow Lil’ Rollin’ Giraffe. Your toddler is probably not ready to push pedals, but this trike is easy for even the youngest riders to maneuver; all they need to do is push themselves along with their feet. The design is sturdy, and it’ll take all the rough treatment your little one gives it. And the paint and stains are all non-toxic, so even if your toddler likes to chew on everything you have nothing to worry about here.